The role of methylfolate in the treatment of patients with depression has once again been highlighted by an article published in the American Journal of Psychiatry in 2016. 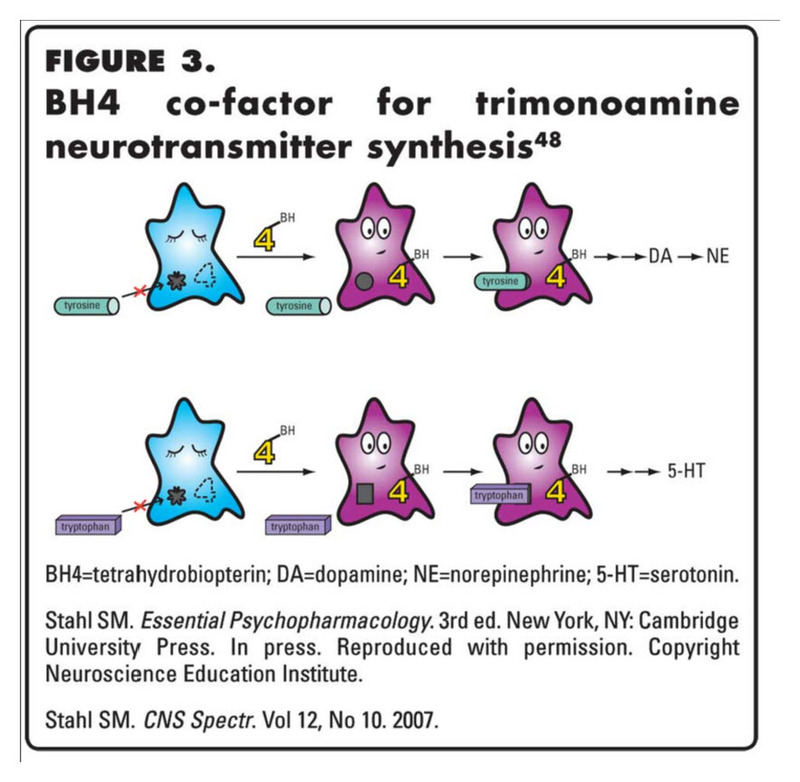 After successfully treating treatment resistant depression in a patient deficient in cerebrospinal fluid (CSF) tetrahydrobiopterin (necessary for biosynthesis of several neurotransmitters) with sapropterin (a synthetic form of tetrahydrobiopterin’s active isomer), investigators searched for this and other potential metabolic abnormalities in 33 patients with treatment resistant depression. 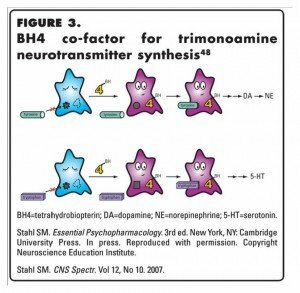 The study found that a very high proportion of teenagers and young adults with well documented treatment resistant depression had some kind of CSF metabolite abnormality (an abnormality in some metabolite suggesting a disorder in the production of neurotransmitters) and by far the most common abnormality was normal serum folate and a low 5-methyltetrahydrofolate (5-MTHF) level, suggesting a functional deficit in the active form of folate that is involved in the production of the monoamine neurotransmitters that seem to be closely tied to depression. Of the 12 patients with CFD, all were treated with folinic acid (1–2 mg/kg per day) for at least 6 weeks (range 6–79 weeks), while continuing their pre-evaluation treatment regimen. Ten of the 12 patients showed reductions in symptom inventory scores at follow-up. For people without the MTHFR gene mutation associated with reduced activity of the enzyme (see below) this algorithm is a reasonable approach to testing for possible folate and/or vitamin B12 deficiency. Folate supplements come in two forms. Regular over the counter supplements and medical foods. Medical foods are reviewed and approved by the FDA which may have some advantages. A medical food is formulated to be administered enterally under the supervision of a physician and is intended for the specific dietary management of a disease or condition for which distinctive nutritional requirements are established by medical evaluation. Medical foods are not drugs and, therefore, are not subject to any FDA regulatory requirements that specifically apply to drugs (eg, requirement for written/oral prescription prior to dispensing, premarket review or approval, proof of safety and efficacy). This is the form of folate that is found in most over the counter vitamins. It is the monoglutamate form and it is not found in nature. Folate in nature is found as various polyglutatmate molecules. Available evidence suggests that natural polyglutamates are converted to the monoglutamate form before absorption (see the NIH Folate document below). Folinic acid is a supplement that enhances folate activity in the body. It is the form contained in leucovorin, which is used when a patient with cancer is treated with methotrexate. It is a vitamer, like methylfolate, which is to say a molecule that substitutes for a recognized vitamin. 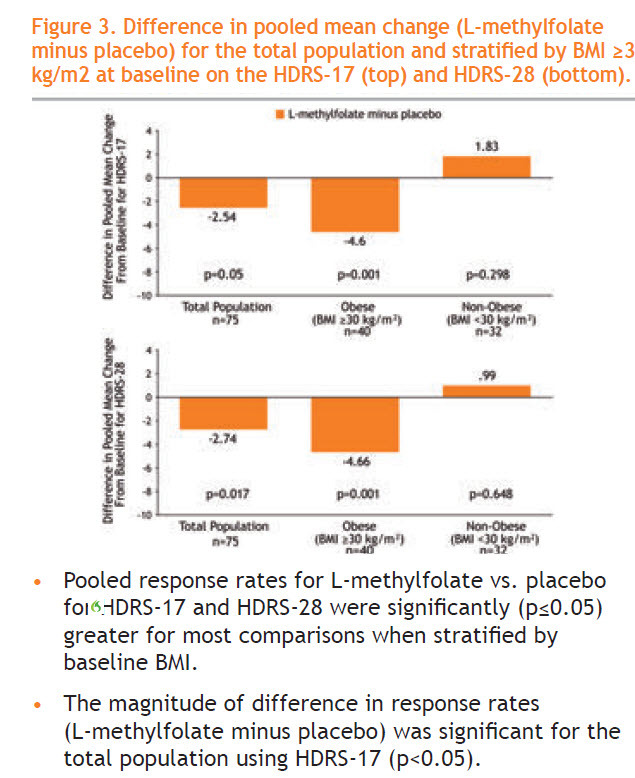 It skips some of the steps in formation of methylfolate and thus may be somewhat more active than folic acid, however it does not skip the MTHFR rate limiting step. Methylfolate is known by various names: Methylfolate, 5-MHTF, and MTHF. And it comes in two isomers, the “L” or “6S” isomer is the active form, and it is also known as Levomefolate, L-5-MTHF, L-methylfolate and L-5-methyltetrahydrofolate and (6S)-5-methyltetrahydrofolate, and (6S)-5-MTHF. Merck holds a patent on a specific type of calcium salt of the “L” isomer (which is markets as Metafolin®) and licenses other companies to make that compound and distribute it in the United States. Gnosis’ Extrafolate-S®, it is similar in likeness to Merck’s Metafolin® in that it is a calcium-salt based molecule that the (6S) isomer of 5-MTHF is bound to. The significant difference between the ingredients Extrafolate-S® and Metafolin® is the salt molecule’s form type. Basically the Extrafolate-S®methylfolate is an amorphous salt form and the Metafolin® methylfolate is a crystalline salt form (Type I). A crystalline salt molecule is more stable which means that Merck’s compound is not as likely to lose potency over time. Gnosis makes another form of levomefolate, Quatrefolic®, which is the glucosamine salt of levomefolate. 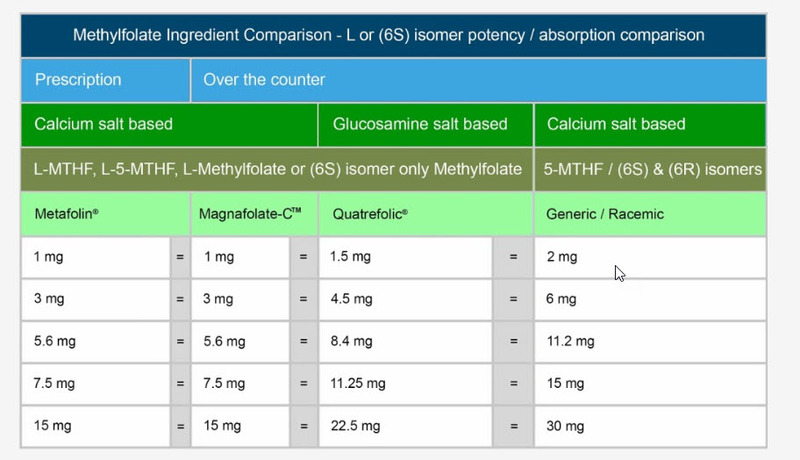 The disadvantage of this form is that you have to take roughly double the dose of Quatrefolic by mg compared with the calcium salt forms because glucosamine is heavier than calcium. The advantage is that the glucosamine salt is absorbed faster. Patients report that this form may be associated with subjective benefits more often than the calcium salt due to faster absorption. Finally, there are a number of over the counter forms of methylfolate which are made up of a combination of the 6S and 6R isomers. See the diagram below for the relationship among these forms. 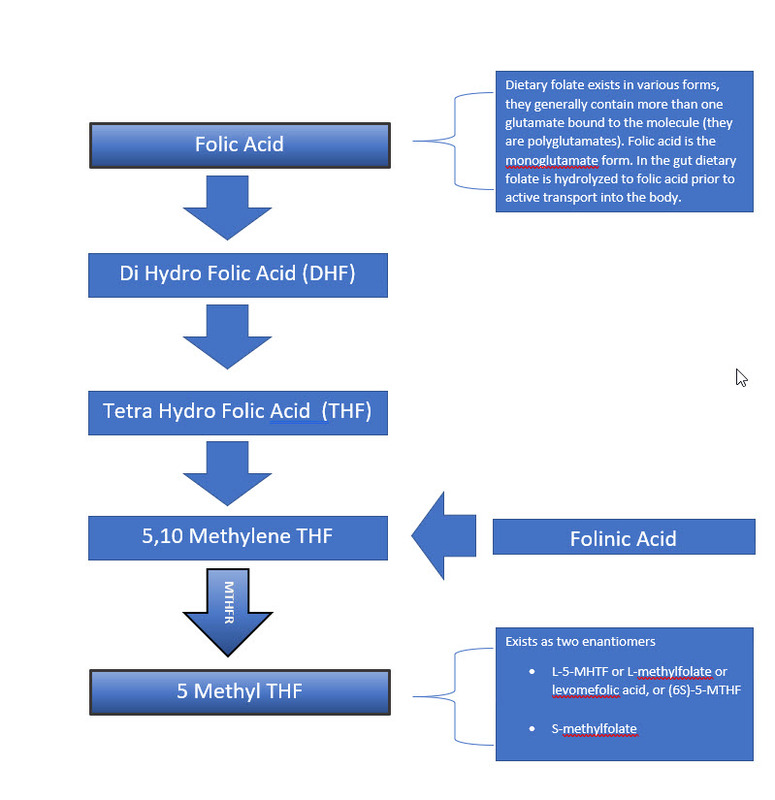 Note that the biologically active form of methylfolate is l-methylfolate and there is at least a theoretical possible that mixtures of the two isomers of methylfolate (which is what you will find in many online supplements, whether or not they advertise themselves as containing l-methylfolate – since mixtures do contain l-methylfolate) might be less effective. Other forms of folate supplements include folate itself (which is what is added to fortified wheat in this country), folinic acid and tetrahydrofolate. There is reason to think that in people with C677T mutations folate may not be effective. Folinic acid is a “vitamer” – meaning a compound that appears to have similar activity to the vitamin itself. It is not clear to me that it is useful in patients with C677T mutations, since it still must be converted to methylfolate via MTHFR. However, note that the study described in the beginning of the article used folinic acid as the supplement. Jarrow Formula Methyl Folate is an over the counter formulation that has been tested by an independent research laboratory and approved. It contains Quatrefolic®, the glucosamine salt of levomefolate (see above). Douglas Laboratories Methyl Folate is an over the counter formulation also tested and approved. It contains the Merck calcium salt, Metafolin®. Unfortunately the prescribed form of l – methylfolate (Deplin) can be expensive and for that reason it would be helpful to know who is likely to respond and who will not. We do know that some people with depression have a gene that may predispose to folate deficiency even when they are getting an adequate dietary supply of folate because they have difficulty converting folate to the active form of the vitamin which is methylfolate. The MTHFR gene affects the enzyme involved in breaking down the amino acid, homocysteine and converting folate and folic acid into its active form, L-methylfolate. Roughly one third of Americans carry one copy of a common MTHFR gene mutation (C677T). People who carry two C677T mutations, which is about 11% of Americans, have a 16% higher chance of developing coronary heart disease compared to people without these mutations and have elevated levels of homocysteine in their blood (homocysteinemia) or urine (homocystinuria) (NIH Genetic and Rare Disease Information Center). MTHFR gene mutations are also associated with an increased risk of other conditions, including depression, but a cause-and-effect relationship has not been established (Liew, Eur J Med Genet 2015; Gilbody, Am J Epidemiol 2007). People with C677T mutations in the MTHFR gene may be more likely to have a deficiency in vitamin B-12 (Zittan, Am J Physiol Heart Circ Physiol 2007) as well as in brain methylfolate levels. Supplementation with both methylfolate and vitamin B-12 may be helpful. For more on genetic testing please follow this link. A small study that was presented in poster form a year and a half ago at the United States Psychiatric Congress suggested that those people most likely to respond not only had treatment resistant depression but also were overweight (obese) and had evidence of an ongoing low-level inflammatory process (an elevated C-reactive protein). The study seems pretty well-designed and the result was very significant. On the right you can see a graph that shows that the response rate to methyl folate was significantly higher in those whose BMI (Body Mass Index) was high. 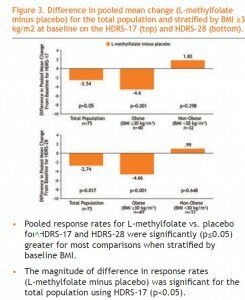 The study found that an elevated C-reactive protein also predicted greater likelihood of response to methylfolate. However one concern that I have is that this study has not been published and usually a well-designed study with an interesting result would find its way into a journal in less than a year and a half. High dose folate supplementation carries certain risks. Prolonged intake of excessive full look acid can cause kidney damage and can also make it harder to diagnose vitamin B12 deficiency because full look acid supplementation can mask the symptoms of B12 deficiency. L-methylfolate may not have this adverse effect. Also high folate levels in the blood in older people who also have low B12 levels may be associated with increased cognitive impairment, whereas high folate and high B12 levels seem to protect against cognitive impairment. Even when B12 levels are normal, high folate levels can significantly increase the risk of peripheral neuropathy in older people who have a common genetic variant in the TCN2 gene. High dose supplementation generally is equivalent to doses above 600 µg of folate (or about 700 µg of Metafolin). “Clinical Effect of L-methylfolate in Patients Stratified by Baseline Obesity and Inflammation in a Randomized Clinical Trial of Patients with Major Depression.” Charles Raison, MD; Richard C. Shelton, MD; Stephen M. Stahl, MD, PhD; et al. Presented at the US Psychiatric and Mental Health Congress. September 30, 2013. UptoDate. 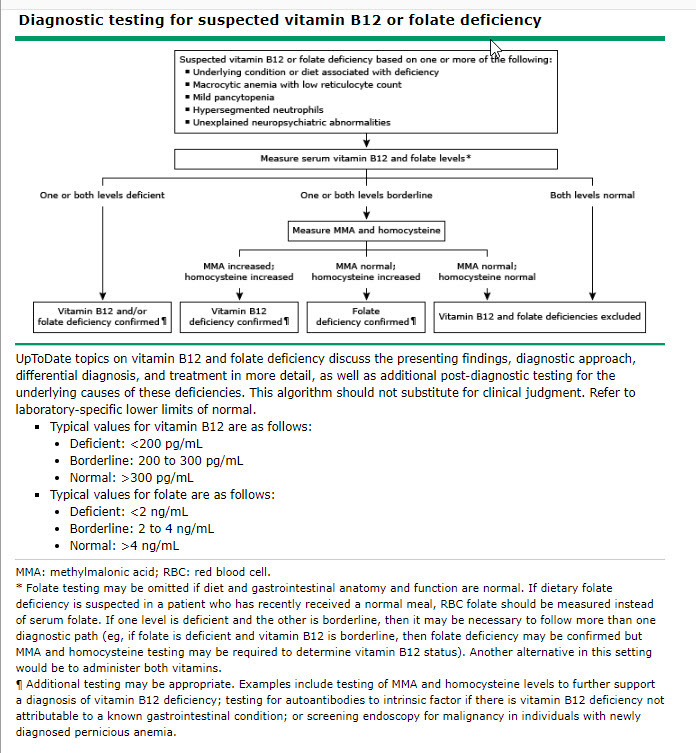 Clinical manifestations and diagnosis of vitamin B12 and folate deficiency. Consumer Labs. Product Review B Vitamin Supplements. NIH Office of Dietary Supplements. Folate Dietary Supplement Fact Sheet.